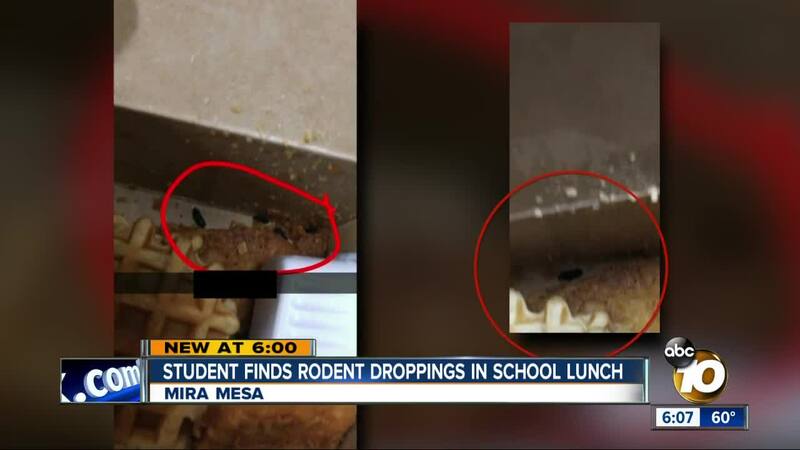 SAN DIEGO (KGTV) — The mother of a Mira Mesa High School student says she’s disgusted after her son found what were reportedly rodent droppings in his school lunch. "Disgust, gross. The first thing I thought of was my son's health," Yolanda Baker said, whose son is a senior at the school. "It's pretty obvious that you can see that there's rat poop there." In an undated letter sent home to parents, Principal Jeff Sabins said the school called district pest management following the contamination on Jan. 11. Baker said her son bought his lunch that day from the school's cafeteria. At first, she said he thought they were specks of pepper. He showed his teacher, the chef, and even the principal who all confirmed it looked like rodent droppings. "The safety and well-being of our students is our top priority, and that includes the food safety of the meals served from our school cafeteria. It is unfortunate this contamination occurred, but we wanted to be completely transparent in letting you know about this isolated event," Sabins said in the letter. Baker said she was notified by the school soon enough. "I think they should have just shut down the cafeteria right away," Baker said. She said the school didn't though. "No one called, there wasn’t an email sent to me, there wasn’t a phone call, I should have been notified." Sabins said a thorough cleaning of the entire school's kitchen was conducted and an inspection was completed by the San Diego Department of Environmental Health, which gave the kitchen a 98 percent, or "A" rating afterward, the San Diego Unified School District said Wednesday. “No vermin or evidence of vermin observed at the time of inspection. Routine pest control invoices available. Observed proper storage of food containers. Confirmed vermin-proofing on doors to kitchen. This complaint was not verified," SDUSD quoted the report as saying. The issue isn't the first time Mira Mesa High has had a reported issue with rodent droppings. In March 2015, 10News was there after a school employee sent photos of rodent feces. "There’s a large amount of rat feces in the library, in the workroom, in the cafeteria." Inspectors came out that time and promised to monitor the situation. Baker says she hopes for a similar outcome this time. "I'm a mom. And this angers me, that I didn't get any contact from the school at all," Baker said. "I mean, they shut down restaurants for things like this." This article has been updated to reflect the results of an inspection by the San Diego County Department of Environmental Health.